Reminding children to take care of their chores can be the worst! Take the nag out of asking by using an easy printable chore chart. 1. Tiffany Collins Designs shares these adorable calendar chore charts. There are two color choices. I love how easy the chart makes it to see which chores were done on each day. 2. The fun design on this chore chart makes it worthy for display. Laminate the paper before writing on it so you can change chore tasks as needed. Get your free printable here. 3. Help motivate your kids with this rainbow colored chore chart. Print and laminate the matching stars for an added fun incentive. You can also have children earn points based on chores completed. Who doesn’t like to earn stars?! Print it from Printable Crush. 4. Your Little Princess won’t give you the royal treatment anymore when you ask her to take care of her “princess duties” instead of her chores. And, really, it just makes sense to call on Cinderella to share some of her awesome cleaning skills. Print out the Printable here. 5. Get those bigger out-of-the-norm jobs done with a work for hire board. This job board isn’t quite a chore chart and it’ll require a framed corkboard, but The Chic Site provides all the free tags and printables here. What a great way for kids to earn some extra cash when they want to buy a toy or hang out with friends. 6. Motivate your Little Star Wars Jedis with some help from the Force. Getting through your Skywalker “Jedi duties” or Han Solo “flight plan” sounds a whole lot cooler than “doing your chores”! Find the printable here. 7. Attach your chore chart right to a cleaning kit. Fill baskets with all the necessary cleaning supplies for a job or group of jobs and then attach a chore chart to the basket with all the jobs that can be done with those supplies. Kids shouldn’t have any problem knowing exactly what to do with this chore chart idea! Find more details from Must Have Mom. 8. This chore chart is a great solution if you need something more visual for all age groups. Even younger children can know exactly what tasks are assigned to them. Children earn tickets for each completed job and can use tickets to “buy” rewards. To help display the cards and tickets you’ll need a pocket chart. Otherwise, get all the free printables and more information from Confessions of A Homeschooler. 9. Turn completed chores into a game with a Tic-Tac-To-Do Chart. Have children fill in a space for every completed job and try to get three in a row. Learn more and get your free game mats from Design Eat Repeat. 10. 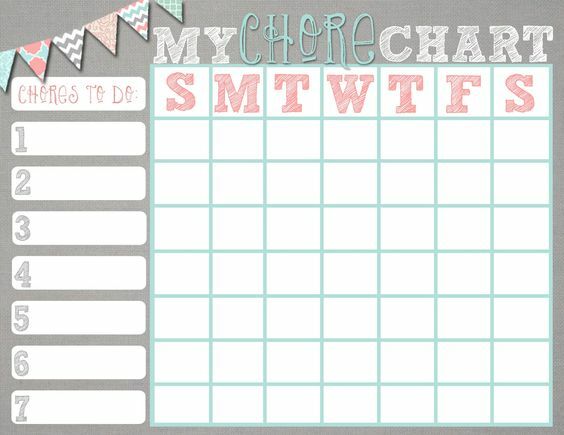 Use Chore Bucks as a reward system with any chore chart. They can be used to buy trips to the zoo or to a movie, or can be used to buy a new toy or special treat. Find your free Chore Bucks here.